After spending spring break in Orlando, dealing with the crowds at Disney World and Universal Studio, I got back home and needed some peace and solitude. One of my favorite places for this is Balcones Canyonlands National Wildlife Refuge which is very close to my home in the Austin area. As an added bonus, it is also wildflower season here in the early spring so I thought I might see some nice flowers along my walk as well. I decided that I would pack around my Nikon D750 with the Sigma 70-200mm, f/2.8 zoom in case I wanted to get some close ups of the flowers. So, the photos in this blog are mostly close-up detail shots that I took along the trail. I got to the NWR about an hour and a half before sunset on Sunday afternoon and began my hiking. There was only one other car in the parking slot and I spent most of my 2 hours of hiking all alone, which is what I desperately wanted. I went up the Rimrock trail to the trails up beyond the ridge and spent most of my time wandering these trails and looking around. 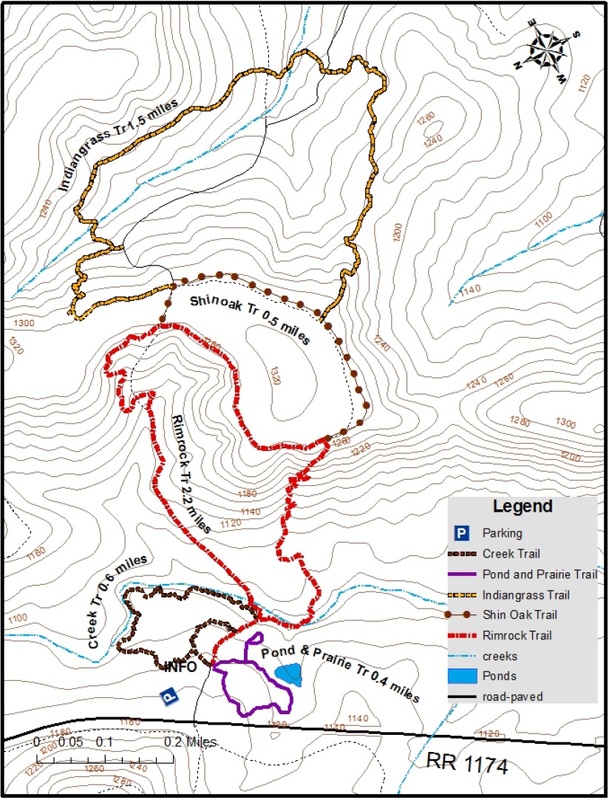 See the trail map below. 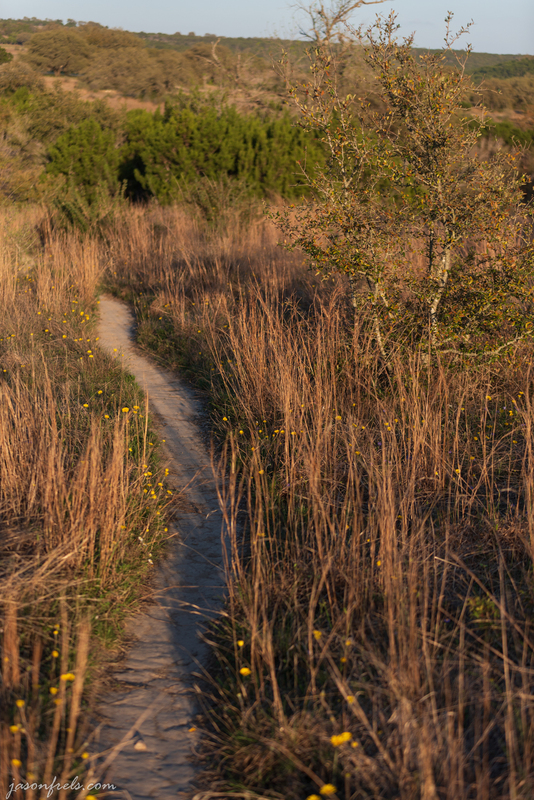 The Indiangrass trail was surrounded by tall grass and wildflowers almost the entire hike. Below is a photo that I knelt down and took along the trail showing the flowers along the trail. I practiced taking several close-ups of the flowers at 200mm focal length. This involved trying to get close to the minimum focusing distance of the lens to get as much of the flower in the shot as possible. I shot with single-point, single-servo auto-focus and I found that this worked quite well with the Sigma 70-200mm. I didn’t have much trouble focusing on the flowers even with stray grass blowing around in the scene. And shooting so close and using an aperture of f/2.8, I got some nice bokeh, See the photos below. 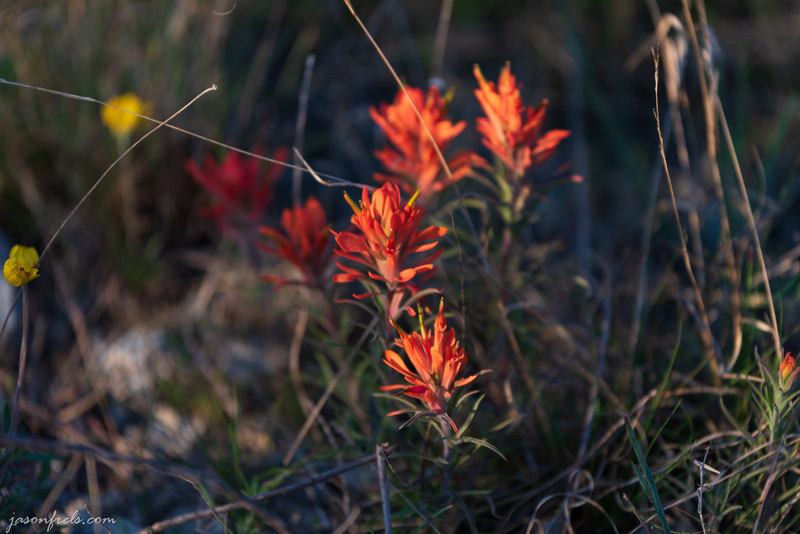 The most impressive wildflowers were the red Indian Paintbrush (I think) that were in various places along the trail. These flowers stand out beautifully amid the long grasses and small yucca in the NWR. I spent a lot of time playing with different compositions with these flowers. The one below captures good light and bokeh in my opinion. I might like to pluck some blades of grass out of the scene. I also came to an overlook with a small pasture with cattle in the distance. I spent some time trying to frame this with the foreground wildflowers. I think that perhaps the cattle are too distant and don’t read very well in the following photo. 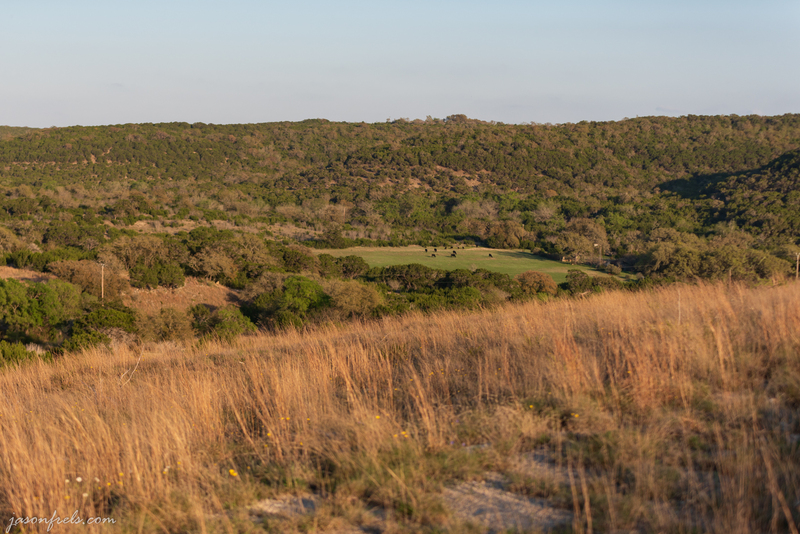 I also shot a quick series of images at 70mm for a panorama including the hill in the distance. The long grasses hide the trail that winds through the image. I didn’t spend a lot of time working this panorama, but I think that it turned out OK. I was hoping to capture the subtle diagonal and horizontal lines in the landscape with the shadows of the late afternoon sun. The sun began to set and I headed back to the parking lot. I really enjoyed my peaceful hike through the hills and grasses after a long family vacation. I also enjoyed my family vacation, but not in the same way. See my main page about Balcones Canyonlands National Wildlife Refuge for more information and photos. I love that area. My college friend’s dad had an 8,000 acre ranch leased near there years ago. We’d spend the weekends “working,” which really meant we rode horses and messed around. It’s beautiful. I feel like it is some sort of secret as I see so few people out there. I think that the most cars I have seen in the parking lot is 4. There is also a sunset porch overlooking Lake Travis and I see a few people there, but not many. I guess most people have no interest in getting out of the city. I am not complaining; I love having the place to myself to hike and enjoy the calm. That’s when it is best–when no one else is there. Beautiful images and a wonderful area to hike ! !